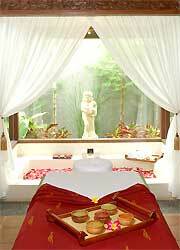 Bali Spa The spa is in the stylish villa "The Ulin Villas & Spa" with private pool. Located in the quiet area where 50m entered from Oberoi Street. It's convenient place to take treatment after shopping or before dinner. There are 10 independent treatment rooms designed for couple use. The recommended menu is fully used fresh vegetables & fruit. The price is reasonable, so you can feel easy to try them. Only at HIRO-Chan! Special Last Day Plan! Offering from Only Hiro-chan! Luxury plan with long spa course! Selected treatment with special meal!! The warm stone massage is utilize the warmth of natural volcanic stones. This can result in alleviation of chronic and acute problems that you may deal with on your ordinary. A unique treatment using blends of natural products and fresh fruits. Cleansing begin with a skin firming massage followed by a gentle exfoliation and steam to eliminate toxin. Fresh fruits mask is then applied followed by face tonic to nourish your face. Shirodara is recommended for those with chronics headaches, insomnia, stress and tension. Choose your favorite scrub from strawberry, avocado, orange, papaya to body scrub massage & body pack. Please enjoy the relaxation time with massage and flower bath. Popular scrub is strawberry which you can smell fruity and sweet. Popular menu Serama Ratih & Fruit Facial set menu! In this Cocoa & Wine Splendour, it will take you to spiritual trip. Our Enchanting Seaweed Spa treatment, begins with peppermint foot bath followed by invigorating seaweed body scrub to detoxify and relieve skin’s impurities. The indulgence continued with seventy minute body massage with aromatic lavender massage. Seaweed and white clay body polish comes next to promote and restore your skin elasticity. This Spa journey concludes with flower petal bath. The holistic ritual starts with foot bath using spices and herbal bath salt to stimulate your circulation. An aromatic body massage with specially blended massage oil is next, followed by exfoliating body scrub. Lemongrass is recommended for fever, respiratory problems, insomnia and muscle sore. Cinnamon to ease fatigue and tension. Rosemary is recommended for stress, colds, flu and respiratory problem. Eucalyptus to enhance the vitality, fever, headache and respiratory problem. Javanese Lulur to beautify and soften your skin, an ancient Indonesian ritual prior to wedding day. Balinese coffee to eliminate toxin and exfoliate your skin. Dead sea mud to tone, revitalize and purify your skin. Seaweed is recommended to heal and soften your skin. Four hands massage is a synchronicity massage where two superbly trained therapists simultaneously guide their hands to facilitate the harmonizing of energies, relief stress and melt away your tension. A soothing body massage comes next to relieve your tension, followed by yoghurt body polish to restore and condition your skin. Your body will be exfoliated with choice of body scrub, followed by body polish with yoghurt to restore and condition your skin. Cinnamon is recommended to remove the impurities and soften your skin. Hair treatment with herb, it is effect for cleasing your head and back to shiny hair. Neck, sholder back and hand massage included. For application of over 2 persons with over 120 min. menu/ person, offer free transfer service for Kuta, Legian, Seminyak, Sanur, Nusa Dua, Jimbaran, and airport. Children can wait in the lobby or treatment room. There are menu for over 12 year-old. Treatment room is beautiful like a palace. I also took a look at the villa for a moment. Next time I want to stay at the villa. I think this spa has the southern country atmosphere.